Here at Obsolete Worlds we’ve always been partial to a bit of Pang. After all, who doesn’t enjoy the simple pleasures of popping bubbles with a harpoon gun? Answer: Anybody who played the horrendous ‘version’ available on the Watara Supervision, which we already reviewed and scored a generous 3/10. While there was nothing inherently wrong with the core gameplay, the developer made the fatal mistake of failing to tailor it to allow for the fact that it was going to be displayed on a device with a screen that suffered from worse ghosting than Luigi on a property viewing. Ghosting; that tendency for sprites to blur into an invisible mess when they move too quickly, is a constant bugbear of early LCD handhelds and so, when we realised that BOOM! Was going to be another Super Pang clone on a system with equally bad ghosting, our hopes were not high. Especially when you consider that it was released a full year earlier than its Supervision cousin. What a wonderful relief, then, to discover that BOOM! is actually a far superior game and, while it can’t quite shake off the limitations of its hardware, this time the developer has done everything in its power to ensure that you, the player, suffer as little as possible from the hardware limitations. 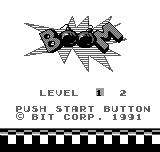 Let’s dial things back a little, though, and begin with the first thing to impress when you boot up BOOM: The game's strikingly good musical score. After the audio atrocity inflicted on us with our first taste of the Gamate (Bomb Blaster), it seemed as if music wasn’t going to be the systems strong point. All the more pleasing then to find that BOOM! sounds great with a pleasing variety of stereo musical scores (through headphones, at least) that change up as you progress through its international themed stages. While the backdrops are more minimalist (a good thing on a non-backlit monochrome display) The stages themselves are a big improvement on the Supervision’s Super Pang, starting out simple and gradually changing things up to involve floating platforms, ladders, rising and falling lava pits and other pitfalls and hindrances. The changes to the level design keep things feeling fresh and challenging and help break up the monotony of simply trying to blast bubbles on a static screen. About those bubbles: There’s no getting around it, the Gamate simply can’t animate that many sprites without flicker and ghosting and so, as with Super Pang on the Supervision it can sometimes be hard to keep track of and avoid them. This time around, however, the developer has made a few subtle changes to the gameplay to compensate and remove the frustration brought about by the hardware. The most obvious one is that colliding with a bubble does not outright kill you as it did in the Supervision game. In Boom! your little bubble popper has six hearts of energy that will deplete when hit. This means that you can absorb hits by bubbles and still live to fight on, even strategically taking them out this way. You can also renew these hearts by collecting falling power-ups salvaged from popped bubbles. This one change alone makes the game so much more tolerable that its amazing that it never occurred to Sachen when they developed the Supervision game a year later. The second change that Boom! makes to the traditional Pang formula is to introduce a Goomba style bad guy patrolling the floor. This monster will kill you in one hit, however your protagonist is equipped with the ability to jump making him a much more agile avatar than the glued to the floor player of the SuperVision title. Numerous health items and power-ups fall liberally as you pop bubbles. These range from machine guns, bombs and enemy freezing time bombs, making it easier to complete stages and even restore lost health. The game also gives you two or three continues should you lose all three lives and there is no irritating restarting of the level should you die. Instead, you simply re-spawn where you were, with a limited period of invincibility. Each world has three stages with a neat little cut-scene of the hero using a balloon to fly to his next destination upon its completion. Unfortunately, as of the time of writing, we haven’t been able to determine how many stages there are as even with these improvements BOOM! is no cake walk. The flickery enemy sprites do sometimes lead to cheap deaths, but in general it’s easy to sense a feeling of progression the more time you put into the game. If you really want a tougher challenge then there is a harder ‘Level 2’ mode available to select on the title screen that turns the game into a one-hit-kill nightmare, although the enemy AI remains otherwise unaffected. BOOM! surprised us in many ways. Its audio quality is wonderful and it’s gameplay addictive and, importantly, it has that pick up and play ‘one more go’ feel that good handheld arcade games should have. It feels tough but fair and while it suffers from the same visual problems that all Gamate games do, the developers have worked hard to compensate for that and should be commended for producing a game that has defied expectations. It’s a game that shouldn’t work on the Gamate, yet somehow does and is an enjoyable experience as a result. Boom! is an enjoyable Pang variant and a great example of how competent programming and creative game design can override even seemingly fatal hardware issues.